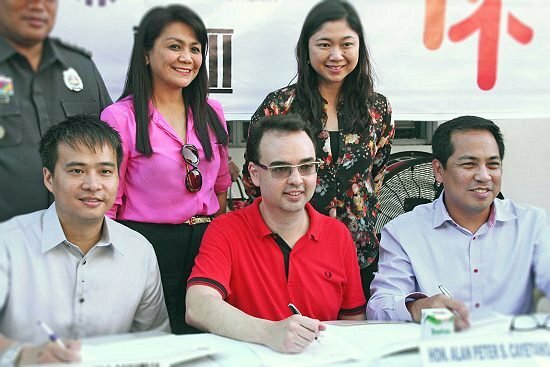 Senator Alan Peter Cayetano with TESDA Secretary Joel Villanueva and Informatics president Leo Riingen during the MOA signing for the BilibIT project that will give IT training to the inmates of BJMP. PASAY CITY – Senate minority leader Alan Peter Cayetano, in line with his advocacy for prisoners’ welfare, launched BILIB IT – an information technology (IT) program designed to give detainees the necessary skills to rejoin the country’s workforce once their sentence ends. He, along with his wife Taguig City Mayor Lani Cayetano and Technical and Education Skills Development Authority (TESDA) Director General Joel Villanueva, graced the event to award program scholarships to the deserving detainees. The senator, in cooperation with Informatics and the Bureau of Jail Management and Penology (BJMP), sees this initiative as a chance to maximize the reform and rehabilitation function of the country’s criminal justice system. He emphasized that the principle behind the Philippine criminal justice system is aimed towards the rehabilitation of criminal offenders rather than on their punishment and that providing education to criminal offenders is the key element for their effective rehabilitation. "Most of our detainees, even when convicted, will not be sentenced to life imprisonment. So how do we help in their reintegration after they have served their time? We should give them the chance to make a living and become productive members of society in the future," he said. "Rehabilitation rather than retribution is the key policy of the State that we must adhere to," he added. Cayetano explained that the scholars who can qualify for the program are those who have served their sentence but preferred to live inside the penal community due to lack of skills necessary to rejoin the work force, detainees who have minimum security, and those inmates with sentences not longer than 6 years. He said that while the program will be spearheaded in Camp Bagong Diwa in Taguig, he hopes that other local government units will also be encouraged to set up similar programs in their respective detention centers. Using the United States practice of allowing inmates to do call center work for non-sensitive matters as an example, the minority leader also expressed his willingness to work with BJMP and the Department of Justice (DOJ) to work on guidelines allowing Taguig inmates to do the same. "Step one is the training. But we'll see if we can try building call centers inside jail facilities to help these detainees utilize their training and gain employment. I eventually want to get there because it's a step further towards better rehabilitation," he said. The lawmaker pointed out that this initiative is part of his IT advocacy as evidenced by the IT scholarships offered by his office to the city of Taguig. Under the IT scholarship program in Taguig, 155 scholars have successfully finished different courses such as Finishing Course for Call Center Agents (FCCCA), computer Hardware Servicing (CHS), Computer Programming, and Web Design. Last October 5, San Miguel Corporation “redeemed” the Series “1” Preferred Shares which represents the original 27 percent of the coco levy funds, now diluted to 24 percent, of SMC common shares ordered converted into preferred shares by the Supreme Court in 2009. The order also stipulated that SMC will have the exclusive option to redeem and purchase on the third year (2012) the 27 percent comprising 753.85 million shares at a fixed price of P75 per share instead of at the prevailing market price. The Presidential Task Force on the Coco Levy Funds headed by the National Anti-Poverty Commission is pushing for the P11.17 billion five-year “Poverty Reduction Roadmap of the Coconut Industry” that includes the Department of Social Welfare and Development’s (DSWD) “Pantawid Pamilyang Pilipino Program (4Ps)” and the Comprehensive Agrarian Reform Program (CARP), and so-called agro-enterprise development. Last April, former Akbayan chief and NAPC secretary Joel Rocamora said the NAPC had drawn up a P10-billion, five-year “road map” to revitalize the coconut industry and that the first year of the program could be funded with loans. “The plan is to borrow off the coco levy,” Rocamora said. “We are about to heighten our fight for the immediate cash distribution and reclaim the coco levy funds from the President and his coco levy fund mafia,” says Chris Chavez, Secretary General of PAMANGGAS and a coconut farmer from Iloilo who still holds stock certificates of coco levy funded oil mills. “The coconut levy fund was plundered by the Marcos-Cojuangco political and economic partnership during martial law. It belongs to small coconut farmers. Its recovery and return to genuine small farmers is long overdue,” says Marbella. The groups called on the House of Representatives to immediately enact into law House Bill 3443 or the proposed Small Coconut Farmers’ Trust Fund Act filed by Anakpawis party-list Representative Rafael Mariano to pave the way for the return of the coconut levy funds. They also call for the Coco Levy Funds Ibalik sa Amin!. 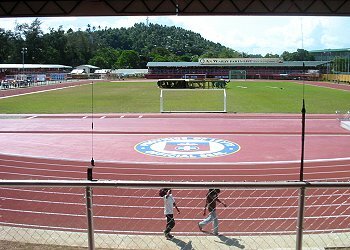 TACLOBAN CITY – The Provincial Government of Leyte will be hosting the 2012 Batang Pinoy Visayas Elimination on November 21-24 at the Leyte Sports Development Center, this city. Batang Pinoy was conceptualized as a national grassroots sports development program for children 15 years old and below as a selection base for potential high performing athletes as specified in Executive Order No. 44 otherwise known as the Philippine National Youth Games. In a meeting held recently presided by provincial administrator Vincent Emnas with the organizing committee and partner-agencies, the sports event committees and host’s responsibilities and other concerns that must be addressed were taken up in preparation of the said activities that will be participated in by both in-school and out-of-school children-athletes coming from Regions 6, 7 and 8. Ms. Annie Ruiz, Batang Pinoy coordinator, said the qualifying sports are arnis, athletics, badminton, boxing, chess, karatedo, lawn tennis, swimming, taekwondo and table tennis. Ruiz said that the national finals for dancesports, weightlifting and softball (girls) will be held also during the Visayas Leg. These sports, Ruiz said, are considered qualifying sports which means that from the National Capital Region (NCR) Leg down to Visayas Leg they will be included. Gold and silver medalists in the qualifying legs will earn slot for the National Championship which will be held in Iloilo on December 5-8. Aimed to identify pool of young talents, Batang Pinoy will break the status of our national team which has been observed to remain the same, Ruiz said. “This time ang Batang Pinoy tulad ng nangyari noong 2011, nakapag-identify ang PSC at Philippine Olympic Committee (POC) nang 10 Outstanding Athletes and were given opportunity para mag-observe sa Olympic Games in London,” she said. Ruiz said that those who will be identified as outstanding athletes from 2011-2013 of Batang Pinoy will have the opportunity to be sent for the Youth Olympic Games which has an equivalent as the Olympic Games for Adults. Batang Pinoy was conceptualized in partnership with the Philippine Sports Commission, Department of Education, Department of the Interior and Local Government, Leagues of Provincies/Cities/Municipalities/Barangays, Philippine Olympic Committee, both Non-Government entities and internationally recognized authorities in different sports which manages and oversee the technical component of this event. PALO, Leyte – A Multi-Sectoral Advocacy Campaign on the Downstream Oil Industry (DOI) will be conducted by the Oil and Management Bureau of the Department of Energy (OMB-DOE) at the Leyte Oriental Hotel at Baras, Palo, Leyte on November 8, 2012, starting at 8:00 o’clock in the morning. To be conducted in cooperation with the Philippine Information Agency (PIA) under the DOE-PIA Communication Initiatives Project, the forum aims to create a critical mass of communicators/media practitioners that would serve as conduits in disseminating the benefits and developments on Downstream Oil Industry. Discussions during the forum will focus on Republic Act No. 8479, which ensures a truly competitive market under a regime of fair prices, adequate and continuous supply of environmentally-clean and high quality petroleum products. Otherwise known as “The Downstream Oil Industry Regulation Act of 1998,” RA 8479 encourages competition and the entry of new players in the oil market, said Dr. Zenaida Monsada of OMB-DOE. She said deregulation of DOI has always been a contentious topic or one that is likely to cause disagreements during discussions, particularly, when it comes to pricing and compliance of gas stations and Liquified Petroleum Gas (LPG) establishments to standards on quality and quantity. Expected to attend the Forum are local government executives in the province of Leyte, licensing officers, members of the regional association of government information officers and local media partners. This is part of the OMB’s Advocacy initiatives in order to create and capacitate a critical mass of communicators that would serve as conduit in disseminating the benefits and developments, Monsada said. Recognizing the crucial role that media plays and its influence to the general public, DOE wants to strategize its IEC a program, including accessing Communicators Network. A pool of communicators/media practitioners would be organized and equipped with information, such as, among others, energy/oil industry situation, pricing mechanism/ methodology, Monsada added. CAMP SEC. RUPERTO K. KANGLEON, Palo, Leyte – Addressing child-labor concerns and preventing children from risks and exposure to hazardous occupation is among the priority of the Philippine National Police. Police Regional Office 8 (PRO8) director Police Chief Superintendent Elmer Ragadio Soria said that the PNP organization is on a stride towards holistic and sustainable strategies to promote and protect children’s right and requests other concerned agencies to work jointly to address this growing threat through the firm implementation of the adequate policies and programs of the government. The Regional Director added that concurrent with its mission and functions, PRO8 promotes the rights and privileges of children and is in the forefront of protecting them against all forms of abuse and exploitation. “We are utilizing in the campaign strategies such as stricter enforcement of child labor laws by working closely with the Department of Labor and Employment as well as local government and community leaders,” he said. “There are permissible activities for children but the bottomline is they should be in school to be globally competitive individuals as they are the future leaders of our country. They deserve a happy and normal childhood far from the hard work and dangers posed by hazardous jobs”, Soria told participants of the Orientation-Seminar on RA 9231 held at PRO8’s Criminal Investigation Course (CIC) Classroom and spearheaded by PRO8’s Women and Children Protection Desk. Some 50 participants composed of personnel assigned with Women and Children Protection Desks (WCPD) and Case Investigators from areas with high incidence of child labor attended the seminar on RA 9231 or “An Act Providing for the Elimination of the Worst Forms of Child Labor" to orient them on the salient features and provisions of said law considering the increasing child labor cases in Eastern Visayas. The law prohibits the employment of children younger than 15 years old, except in some cases. The same measure said that a child who is 15 years old but younger than 18 shall not be allowed to work for more than eight hours a day and in no case beyond 40 hours a week. The same Act provides penalties for violations such as imprisonment and fines. Based on the 2011 Survey on children, out of the estimated 29 million Filipino children aged 5 to 17, around 5.5 million are already working and almost 3 million are in hazardous child labor, a 25 per cent increase from 2.4 million in 2001. Hazardous child labor was higher among boys with 66.8 per cent as compared to girls with 33.2 per cent. The National Statistics Office conducted the survey with the support of the International Labour Organization and the US Department of Labor. “Millions of children who are working, overworked and underpaid, physically and psychologically abused, deprived of the opportunity to study, play, innocent and helpless ones unable to defend themselves from the injustice inflicted upon them by the very ones who should protect, nurture and care for them. We must take serious, hard-line stance against child labor and apprehend offenders at once," Soria said. Police Inspector Yasmin Vilches, PRO8 WCPD Chief and the Training Supervisor, informed that the term “child labor” are work or economic activity that deprives children of their childhood, their potential and their dignity. It subjects child or children to exploitation, with works harmful to health and safety, physical and mental, or psycho-social development. “Hazardous child labor, on the other hand, is defined as being likely to harm children's health, safety or morals by its nature or circumstances. Children may be directly exposed to obvious work hazards such as sharp tools or poisonous chemicals. Other hazards for child laborers may be less apparent, such as the risk of abuse or problems resulting from long hours of work. Hazardous work is considered as one of the worst forms of child labor”, she added. Citing data from the survey, there are around 722,534 working children in Eastern Visayas region, in which an estimated 213,000 children are exposed in hazardous labor conditions, one of the highest nationwide at sixth, Vilches said. Most of the forms of child labor existing are in mining; farm work; deep-sea fishing; pyrotechnics production; stevedoring; vending; rubber budding; banana bagging; cargo loading; sugarcane farming; scavenging; construction and quarry site works; waitressing/waitering; and pedicab driving. QUEZON CITY – Environmental groups condemned another attempted assassination of an environmentalist in Carmen, Surigao del Sur. At around 3:30PM on October 29, Dr. Isidro Olan, executive director of the Lovers of Nature Foundation Inc., was shot by unidentified assailants in an abandoned lumber-scaling area as he was driving homebound. Dr. Olan survived the attack and was rushed to the Madrid Municipal Hospital. “Dr. Olan was a passionate environment defender who opposed destructive and large-scale mining as well as illegal logging activities in Cantilan and other areas of Surigao del Sur. We ask for everyone’s prayers for Dr. Olan’s immediate recovery, and for justice to be swiftly exacted upon the assassins and their clients as well,” said Fr. Oliver Castor, spokesperson of Task Force Justice for Environment Defenders (TF-JED). The physician-activist and his group Lovers of Nature Foundation were planning to launch a voter education campaign in the province’s schools to promote an environmental agenda in the coming 2013 elections, particularly local government officials that have supported environmentally destructive corporations such as the logging company Surigao Development Corporation and the large-scale Marcventures Mining and Development Corporation. “It’s not even Halloween and yet this latest attack on Dr. Olan already produces a chilling effect to environmental advocates. 2012 is already the bloodiest year for environmental advocates in this new millennium, and it infuriates us to remember that Pres. Noynoy Aquino dismissed the ever mounting cases of human rights violations in the country is dismissed as just propaganda of the Left. Is the attempt to take the life of Dr. Olan for his defense of the environment not real enough for Aquino?,” said Clemente Bautista, convener of the Defend Patrimony Alliance, a network opposed to resource plunder particularly in mining. In this year alone, the TF-JED recorded 13 extrajudicial killings of environmental advocates. Beyond killings, the frustrated murder of Dr. Olan is the second case of attempted assassination and at least the 20th overall incident of human rights violations (HRVs) in the country in 2012. Recently, Juvy Capion and her sons Pops and John were massacred by elements of the 27th IBPA of the Philippine Army. “There could be no other motivation to assassinate Dr. Olan than his staunch opposition to ecologically destructive projects in their areas. If the Aquino government claims to be hard workers for the protection of human rights, we demand to hear about their work on Dr. Olan’s case now. In fact, we would like to hear what about what they have done now about the 61 extrajudicial killings of environment defenders we recorded since 2001 that remains languishing in court up to the present,” challenged Fr. Castor. Locals have noted the saturation of military operations from the Philippine Army’s 30th and 38th IBPA and its 3rd Special Forces of the 402nd Brigade in the area started with the entry of Marcventures and other mining operations. “Militarization of Surigao del Sur as a means of protecting mining investments have brought a spate of not only HRVs but also the violation of the economic, social and cultural rights of its indigenous people and other grassroots communities. Militarization could well be linked to Dr. Olan’s assassination. We demand the pullout of military operations along with Marcventures from Surigao as an important step to the quelling of HRVs in the area. Aquino must also prioritize the junking of various mining liberalization policies that have legalized the militarization of mining areas as an incentive for foreign mining investments,” said Bautista. The Defend Patrimony called for an immediate and independent investigation of the attempted assassination, and the demobilization of Investment Defense Forces (IDF) which allows military and police forces to be employed by corporations to protect their mining facilities and operations. QUEZON CITY – The remaining ten pesos of the 30-peso wage increase for Metro Manila workers ordered in June 3, 2012 will take effect on November 1, Thursday. Thus the minimum wage for metro workers would be 456 pesos for non-agricultural workers while 419 pesos for agricultural workers, the Trade Union Congress of the Philippines (TUCP) president Democrito Mendoza reminded the employers and management yesterday. The increase was granted following the wage increase petition of P90 of Mendoza for 700,000 workers in Metro Manila on March 16, more than a month before the one-year prescribed period for filing of new wage increase took effect. The petition cited as basis for an increase the high prices of basic foods, increase in cost of services, tuition fees and liquefied petroleum gas. The wage order also increases to 419 pesos the minimum wage for those Metro Manila workers working in private hospitals with bed capacity of 100 or less, retail/service establishments employing 15 workers or less, manufacturing establishments regularly employing less than 10 workers. The National Capital Region of the National Wages and Productivity Board turned down the petition saying there is no supervening condition that would warrant the issuance of a new wage order. However, the wage board conducted a series of public hearing in Taguig, Manila and Quezon Cities in determining the exact amount to be increased once the 1-year prescribed period expired on second week of May 2012. “Part of the wage order 17 implemented last June, this 10-peso increase is welcome news for minimum wage earners. The increase is in effect despite of separate appeal for reconsideration filed by Atty. Mendoza and by the Employers’ Confederation of the Philippines,” said Alan Tanjusay, TUCP advocacy officer. “A Filipino family of 6 needs at least 993 pesos every day to live decent lives. We still have a long way to go,” he added. The employers group filed their motion days after wage order 17 was released citing the increase was too big. The TUCP filed an appeal citing the increase was too small. The statement was issued today by Bonifacio Ilagan, Vice-Chairperson of the Samahan ng Ex-Detainees Laban sa Detensyon at Aresto (SELDA). On October 24, the US Court of Appeals for the Ninth Circuit upheld a contempt judgment on Sen. Ferdinand “Bongbong” Marcos, his mother Imelda and the estate of the late dictator, Ferdinand Marcos for violating a court order transferring the assets of the estate. “The decision is a smack in the face of the Marcoses who continue to arrogantly hold on to their ill-gotten wealth and to use it to remain in their lofty positions and power,” Ilagan stated. Bongbong sits as a senator, mother Imelda is currently a congressman and sister Imee is governor of Ilocos province. Both mother and daughter are running for re-election in next year’s elections. The US Court of Appeals has ordered that martial law victims be awarded US$353.6 million resulting from the daily fine of $100,000 from February 3, 1995 to February 3, 2005 imposed by the Hawaii Court of First Instance. Despite this, the victims of the Marcos dictatorship has yet to be indemnified after winning the historic Class Action Suit against Marcos in 1992. SELDA warned the current Aquino government from entering into any agreement with the Marcoses that would compromise the martial law victims. It stressed that now is the time for it to complement the US Court of Appeals decision with positive action by pushing the Senate to act on the indemnification bill, as well as hold the Marcoses and their cronies and henchmen accountable for their crimes against the Filipino people. “What worth is this victory, if the Aquino government continues to ignore our demands for justice and even turns chummy chummy with the Marcoses?” Ilagan queried. “Whatever we gained through this latest US Court decision should not end up being ill-gotten once more.” SELDA concluded. PALOMPON, Leyte – An event to look forward to during the upcoming long weekend, is the Second Open Invitational 15 kilometer Kayak Marathon race in Eastern Visayas which the Local Government of Palompon, Leyte is hosting on November 3 at the enchanting Kalanggaman Island which is fast becoming a major tourist destination in Leyte. DOT Regional Director Karina Rosa Tiopes informed that this event is the opening salvo of the 2nd Palompon Lawig Festival 2012, in honor of the town’s Patron, Saint Francis Xavier and in commemoration of the town’s fiesta on December 3. The kayak marathon which aims to promote camaraderie, environmental protection thru eco-water sports intervention, encourage beyond border tourism, and appreciate the beauty of local culture and history, is being organized by the Palompon Municipal Eco-tourism Council Incorporated (PMET Inc.) and North West Leyte Tourism Alliance in collaboration with the Canadian International Development Agency (CIDA). It is supported by the Department of Tourism, Provincial Government Unit of Leyte, 4th District Congressional Office, Philippine National Police, Philippine Coast Guard and various entrepreneurs, business groups and civic organizations from the private sector. Mr. Rene Camposano, PMET Inc. president said that kayak sounds unfamiliar to the local folks but its fundamental nature has a strong parallel to the very roots of Palompon’s history. Palompon, being an old coastal town in northwestern Leyte, traces its name from the cluster of mangrove flowers / propagules that floats idly at the shallow portion of the harbor. A Kayak is a small, relatively narrow, human-powered boat primarily designed to be manually propelled by means of a double blade paddle. The traditional kayak has a covered deck and one or more cockpits, each seating one paddler. In the evening of November 2, the night prior to the kayak race will be a Jamaican Night for the kayak race participants who maybe a beginner, intermediate or advanced kayaker with at least 21 years of age. The grand kayak race will be participated in by 30 pairs of Kayak aficionados who are required to wear their assigned numbers and life vests during the race. The race will start at 6:00 a.m. sharp from Kalanggaman Island going to Palompon Port. Cash prize of P15,000 with trophy will be given as first prize; P10,000 plus trophy to the second prize; P7,000 with trophy for the third prize; P5,000 with trophy for the 4th prize and P500 plus freebies for the 10 consolation prizes. Palompon is a 2nd class municipality in the Province of Leyte, Philippines with fifty (50) barangays, nine of these are in the town proper. It is 124 Kilometers away from Tacloban City, the provincial capital of Leyte Province, 66 Kilometers from Ormoc City, the commercial growth center of the western coast of Leyte province and 72 nautical miles from Cebu City. Kalanggamanan Island, on the other hand, is a 5.4 hectare island located northwest of Palompon. Politically, it is a sitio of Barangay Tinabilan, this municipality. Kalanggaman has a shifting eastern sandbar with an approximate length of 320 meters and western sand bar with an estimated length of 238 meters. It has a distance of 15.90 kilometers or roughly 8.6 nautical miles from the town center and reachable only thru marine-based transportation. The main attraction of this eco-tourism site is the island itself because of its white sand beach and magnificent sand bars. It offers wide arrays of eco-tourism activities such as snorkeling, swimming, sun bathing and SCUBA diving. It has VHF (Very High Frequency) radio communication system for emergency and has cellular phone signals from all the major cellular phone providers. It has a 24/7 TOP COP (Tourism Oriented Police for Community Order and Protection) personnel on duty, tour guides and beach combers. The island has open cottages, restrooms and dressing rooms and admirable camping area for those who opt to stay overnight and has a physical carrying capacity of 1200 persons/day.